Here is the satellite map of Rohtang Pass: Here is Yann heading getting ready to leave our guesthouse in Manali for our first official day of cycling: Now here I am, 3hours (including breaks) and 7km into the ride: Here are our bikes after a negotiated settlement between the two parties: Yann, still happy, with his fully-loaded bike: Our initial plan had been to cycle the 55km up to the top of Rohtang Pass and then another 20km or so to the next village. We set our first goal as Kothi, a town 6km away. We happened, miraculously, to be travelling on the day that the road is closed to tourist vehicles. At the village of Kothi a roadblock is set up to control traffic. When we arrived a queue of vehicles were lined up waiting to be let through (they would have to wait until late afternoon when the tourist-ban is lifted). We cycled through without asking any questions and the Indian soldiers didn't seem to mind. We plodded away, took lots of rests and counted the kilometres cycled and the metres climbed. We had the road mainly to ourselves until the evening when the queue of cars caught up to us. On this first day of cycling we rode for 14 hours, cycled 35km and climbed 1400 metres. We slept our first night in Marhi, basically a truck stop with a few make-shift tents and restaurants for Indian tourists breaking their trip up the pass. We overpaid for a tent with two cots, but we felt too exhausted to set up our own tent and make dinner. The next morning, the sounds of cars heading up the pass began at 3am. 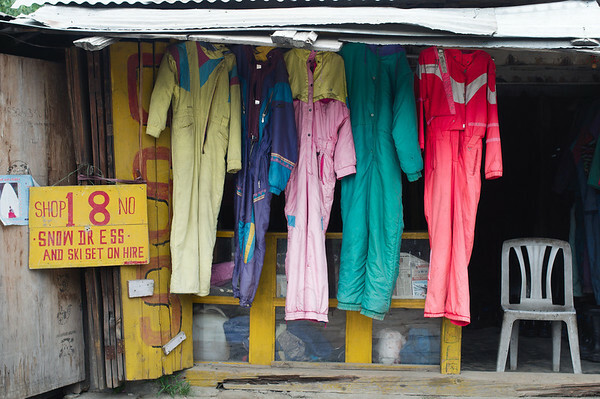 By the time we woke up, every restaurant in Marhi was packed with tourists, having breakfast, renting snowsuit, buying mittens and toques. We didn't feel bad about oversleeping our 5am departure time by 3 hours ... we wouldn't have beat the traffic anyways. The climb from Marhi to the top of Rohtang Pass was much what we had expected, switchbacks on a mostly unpaved, often muddy narrow road. A toppled truck and landslide had caused a serious traffic jam, so we managed to ride a few hours without too many honking assaults. The cars eventually caught and usually passed us closely and dangerously. But we were never too angry because they would shout cries of encouragement as they did "God Bless you! ", "keep going", "you can do it", "you are so strong". Near the last series of switchbacks we caught up to the accidents that had backed up cars for kilometres. It took us hours to weave our way through stopped traffic. We got lots of attention and were photographed by nearly everyone we passed. We did as much as we could cycling but spent a lot of our time pushing our bikes through the mud wondering if anyone would ever get off the mountain. 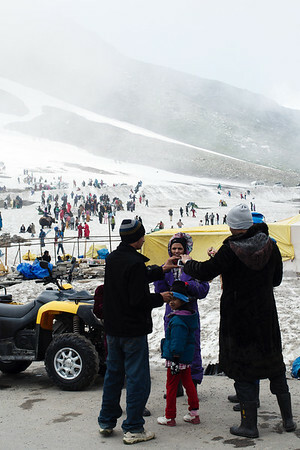 Tourists queue on dangerous mountain roads for hours, for the opportunity to visit Rohtang Pass and play in the snow. 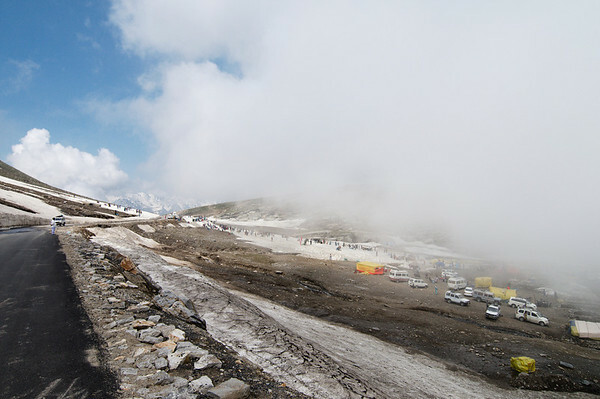 In the summer, over 6,000 tourist vehicles travel to the top of the pass every day. They are clad in full snow suits (we considered it t-shirt weather) overpaying for a range of snow-related activities: skiing, snowmobiling, yak riding, snow-ball fighting. A majority of the tourists never continue onward into the Lahaul Valley that begins on the other side of the pass. I reinherited my paniers for the way down to Khoksar. We left the thousands of tourists behind and descended into the pristine Lahaul Valley. The road was ours again and we felt that the worst riding would be behind us. Trekking is among the top notch adventure activity. The different types of trekking helps you learn many things. You need to make sure you make the most of it like at https://www.imanali.in/manali-tour-package-calicut when you go out for trekking. Look for the best treks and join.